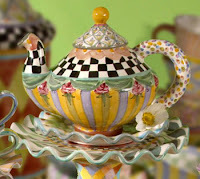 MacKenzie-Childs ceramics and gifts are known for their artistic quality and design - each a unique piece unto itself. MacKenzie-Childs now brings the same eye for detail to their outdoor furniture and garden accessories collection and I’m proud to bring them to the Chelsea Gifts customers. Join us in shopping the entire MacKenzie-Childs line and enjoy #FreeShipping on ALL MacKenzie-Childs furniture through May 31st! Started in 1983, MacKenzie-Childs is located along the Cayuga Lake in central New York state on a former dairy farm surrounded by rolling hills and flowering meadows. It is this serene landscape that inspires the artists that design and create one-of-a-kind pieces for each MacKenzie-Childs collection. From teapots to flower pots, every piece is hand-painted and a collectible. Now, with their outdoor furniture collections and garden accessories, you can create a warm and inviting outside space that will rival any living room. Using only the highest quality weather resistant and stylish materials for the Sunset, Greenhouse, and Flower Market outdoor collections. 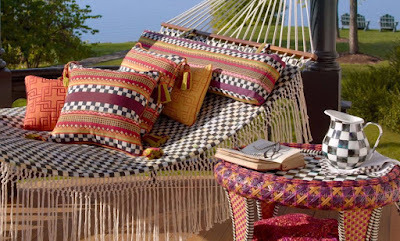 Finish off any outdoor paradise with planters, pillows and cushions, birdfeeders and even gardening tools from MacKenzie-Childs. The MacKenzie-Childs outdoor collection is as functional as it is beautiful and your home for every piece is Chelsea Gifts. Whether you’re planning a garden party, a beach party or an engagement party, Chelsea Gifts has you covered. From jewelry to home decor, we partner with only the best designers to ensure a true boutique experience. I even have a team of professionals available 7 days a week to assist you in creating gift or bridal registries. Call us today 732-693-0001, visit us online or shop in our store at The Grove in Shrewsbury. Australia can be seen as the largest off-season market in the southern hemisphere's , open up good market in Australia can be obtained when the domestic season more Order Single ,http://www.gardenarteu.com for glass table production operations, stable staff and other aspects have a positive effect. From the viewpoint of operating strategy , the company has established a stable customer base in the European market , quality garden furniture the expansion of the market for the northern hemisphere markets has been strongly support the Australia expansion listing in Australia , New Zealand. Sino-Australian free trade outdoor sofa agreement is expected to enter into force as soon as possible, aluminum pool furniture Cao Jianhui also said he expects the logistic expense reduction for the competitiveness of enterprises, enhance the product's appeal brings . He said the state of the strategic decision to reduce the barriers to trade in Australia , I believe in the future there will be more Australian import and export enterprises benefit from.